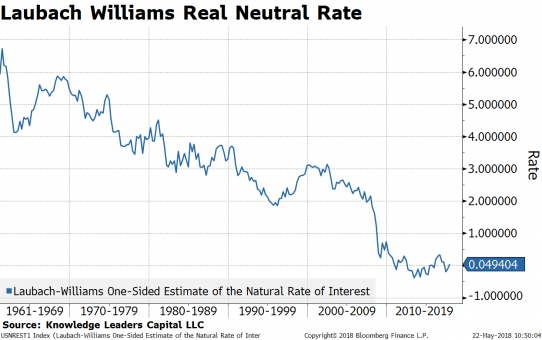 Yesterday John Williams, one of the newest members of the Federal Open Market Committee, wrote an article titled “The Future Fortunes of R-star: Are They Really Rising?” where he summarized his views on real neutral interest rates. “R-star is what economists call the natural rate of interest; it’s the real interest rate expected to prevail when the economy is at full strength. While a central bank like the Fed sets short-term interest rates, r-star is a result of longer-term economic factors beyond the influence of central banks and monetary policy. Consistent with this definition, my discussion will focus on the longer-term r-star that will prevail over the next decade, in contrast to a shorter-run concept that may fluctuate from year to year depending on economic developments”. From there he went on to address the recent optimism surrounding a potential increase in R-star. He continued by identifying each of the drivers of real rates and his opinion on each. “Changes in demographics affect r-star on a number of levels. We are living longer: Over the past three decades, life expectancy in developed economies has risen by nearly five years and is expected to keep rising (United Nations 2017). When people expect to live longer, they tend to save more for retirement, and this increased saving puts downward pressure on interest rates. Despite the fact that we’re living longer, labor force growth in the United States has actually slowed, largely due to baby boomers retiring and a lower fertility rate. In fact, the labor force is forecast to grow just ½% per year over the next decade, well below past trends (Congressional Budget Office 2018). Fewer people joining the labor force means fewer people working, producing, and consuming things, which leads to slower growth and less investment, which in turn drives r-star down. The same thing is true of productivity growth, which has also slowed compared with earlier decades (Fernald 2016). In the 1990s and early 2000s, the explosion of the internet and computing power led to annual productivity gains averaging 2 to 3%. Productivity gains since the recession have generally hovered around 1%. He went on to acknowledge that there are some tailwinds that may serve to boost R-star, but he then he throws cold water on the argument, specifically citing the recent tax cuts and fiscal stimulus. “Looking ahead, I expect the expansion to continue, with growth averaging around 2.5% over this year and the next. There are a few tailwinds that account for this solid economic performance. These include strong financial conditions, solid global growth, and the fiscal stimulus. It’s these strong tailwinds that are leading some people to believe that we’ll see r-star move back up. But, as I said, this optimism is, sadly, misplaced. He wraps it up with a summary of where the Fed began in this cycle, where it is now and where he thinks it is going. “Following the global financial crisis, the Fed cut interest rates and kept them low to stimulate the economy and get it back on its feet. Now that the expansion is well under way, we’re in the process of normalizing monetary policy and bringing interest rates back up. Based on the center of the distribution of projections from our March meeting, the FOMC has indicated a total of three to four rate increases this year and further gradual rate increases over the next two years will be appropriate (Board of Governors 2018b). I view this to be the right direction for monetary policy. 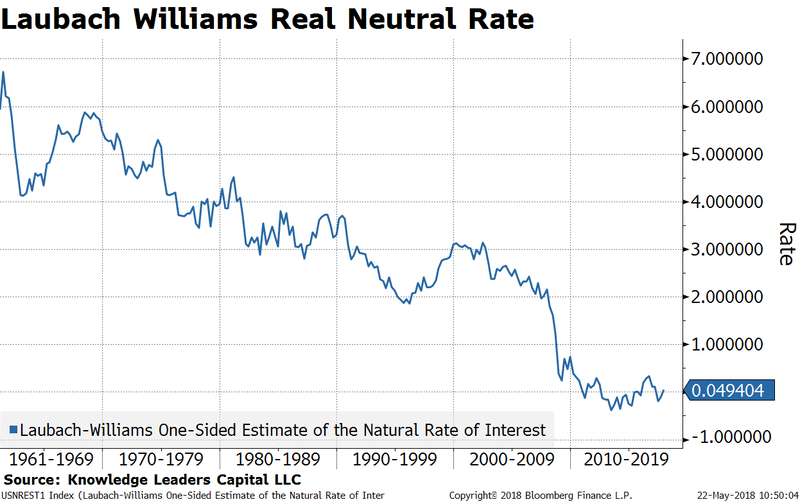 The latest reading of the Laubach-Williams real neutral rate is only about 5bps, so even expectations for a slight increase to 50bps is progress from here. If I punch into my Bloomberg a Taylor Rule based on the assumption of .5% real neutral rates, current inflation of 1.88% Core PCE and a 4% NAIRU, the output is a federal funds rate of 2.42%, very close to Williams’ thinking. This is somewhat below the last “Dot Plot” which pegged the December 2019 rate and terminal rate at 2.875%. Just when the Fed appears to be retreating from forward guidance, this is a revealing look at how the membership of the FOMC views the expected rate path. That path doesn’t appear as steep as many fear, with President Williams calling the “under” on the Dot Plot.